Fresh off a fearsome encounter with the Neverland crocodile, Jocelyn Hook decides the most practical plan is to hunt down her father's famous fortune. But the map proves to be a bit harder to crack than Jocelyn had hoped, and she's convinced that the horrible Peter Pan might be the only one with the answers. Of course, he doesn't really feel like helping her, so Jocelyn takes the only reasonable course of action left to her: she kidnaps his mother. Evie, though, is absolutely thrilled to be taken prisoner, so Jocelyn's daring ploy doesn't have quite the effect she'd planned for. Along with the problem of her all-too-willing captive, Jocelyn must also contend with Captain Krueger, whose general policy is that no deed is too dastardly when it comes to stealing Hook's treasure. And with the ever-shifting Whens of the Neverland working against her as well, Jocelyn, Evie, Roger, and the rest of the Hook's Revenge crew have their work cut out for them. Last year, I read and thoroughly enjoyed Hook's Revenge, the first adventure of Hook's daughter Jocelyn as she faces off against the Neverland crocodile to avenge her father's death. Though that novel ended on a note of certainty, I was incredibly excited to learn that there was going to be a sequel. 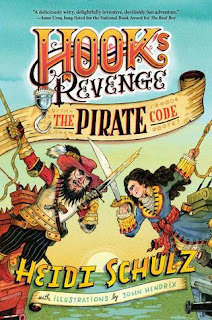 And friends, The Pirate Code is just as fun and delightful a read as its predecessor. Schulz immerses us into the world of Jocelyn, her friends and her foes yet again, this time inviting us to come along as Jocelyn endeavors to use her father's map to find his treasure. 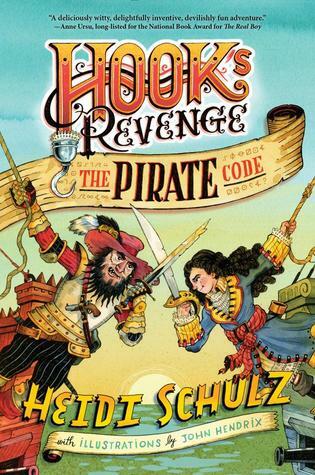 One of the impressive things about The Pirate Code is how Schulz manages to maintain the consistency of the narration. Readers are treated to the same playful, witty narration from a mysterious storyteller, and it's just as marvelous as it was the first time. I seriously couldn't get enough of the pirate slang and the asides included! But equally impressive is how Schulz manages to create another unique chapter in Jocelyn's story. In her quest to find treasure, Jocelyn finds herself facing all sorts of unexpected situations, some serious, some less so. Schulz deftly combines whimsy and practicality to create a tale that's both educational in theme and fun to read, and I admire her ability to do so. I thoroughly enjoyed revisiting Neverland and spending some more quality time with Jocelyn and her crew. Heck, even encountering her foes, old and new, was a riot! I couldn't stop marveling over the creativity and imagination that went into creating this compelling tale. It urged me to stay with Jocelyn from beginning to end, and I complied with a grin on my face. All in all, Heidi Schulz has once again crafted a novel that is funny, thoughtful and highly entertaining - and I look forward to seeing more worlds and characters come to life at her hands. Love your review and I completely agree! It was just as creative, imaginative, and enthralling as the first book. And it surprisingly tugs at your heartstrings too. I love the narrator and the way Heidi mixes in Neverland/Peter Pan mythology with her own vision. And I really love Meriweather hehe. Such a delightful sequel! This looks so cute and I am always up for a Peter Pan retelling! That narration is just brilliant! I love that sarcastic tone. It gives the right feeling to the entire story.